Our prescription for comfort. 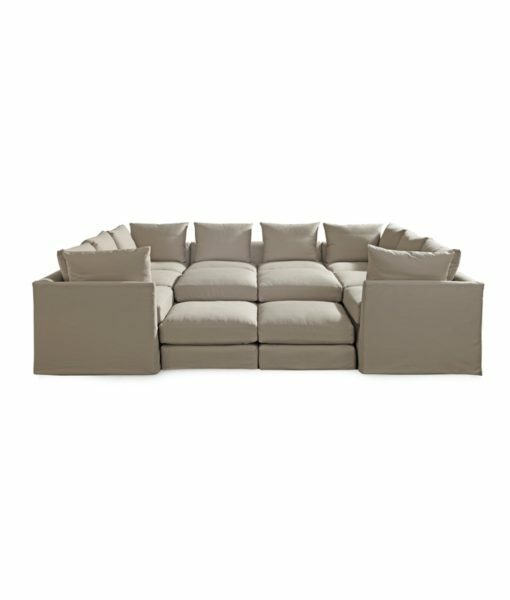 The Dr. Pitt modular collection allows for endless sectional configurations – from massive to mini – to remedy all of your seating ailments! Pull the pieces together for a slumber party of epic proportions or pull them apart to form a cozy space conducive to cocktails and conversation. Machine washable slipcover in a white cotton canvas for easy care. Eco-friendly kiln dried hardwood frame and cushioning – slipcovered or upholstered. Customize Dr Pitt in your choice of fabric. Available tailored or slipcovered.